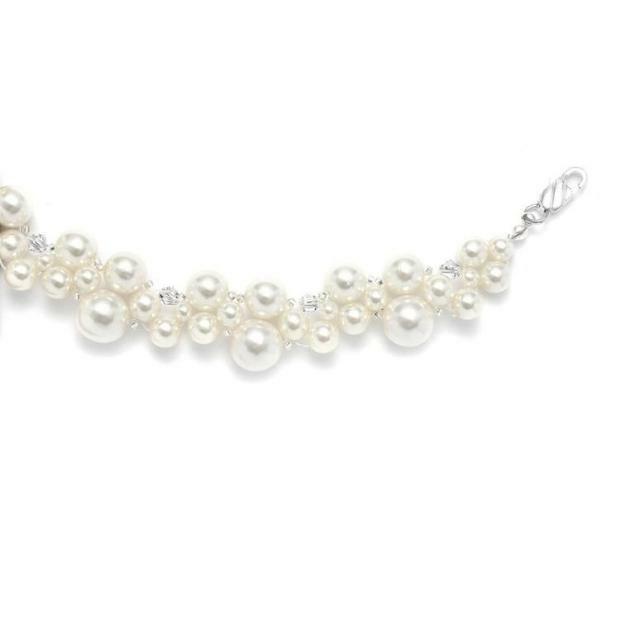 * This captivating hand-woven bridal bracelet by Mariell has a dramatic mix of crystal and pearl bubbles and is also a fabulous mother of the bride accessory. * This captivating bridal bracelet by Mariell features a dramatic mix of assorted pearl 'bubbles' brilliantly accented with clear Austrian crystals and seed beads. * This hand-woven bracelet is made in the USA and is available in your choice of 9 elegant pearl colors with an adjustable 7" - 8" silver clasp. * This sophisticated necklace is also a fabulous mother of the bride accessory. * It has a beautiful matching necklace 2113N and earrings 2113E sold separately.